England striker Kelly Smith scored twice as FA Women's Cup holders Arsenal eased into the quarter-finals with a 2-0 win against Gillingham. Last season's runners-up, Bristol Academy, were the only Women's Super League casualty, losing 2-1 at Chelsea after extra time. Top-flight teams Birmingham City, Everton, Manchester City, Notts County and Liverpool all progressed. The only non-WSL team through is Portsmouth, who beat Durham 2-1. 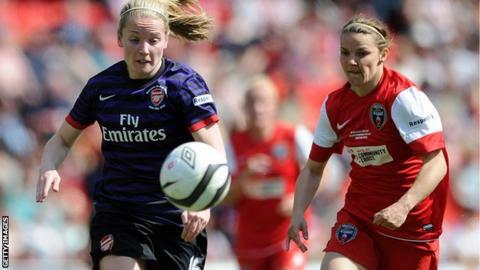 The Gunners were in control from the start, but Gills goalkeeper Faye Baker pulled off several fine saves. It took a 63rd-minute Smith penalty to give the hosts the lead and the England international wrapped up victory with nine minutes remaining. South Korean midfielder Ji So-Yun, signed from Japanese club INAC Kobe, was quick off the mark on her Chelsea debut with a goal after just eight minutes. Bristol equalised with a 29th-minute penalty by Spanish striker Natalia, then went close to taking the lead when Natasha Harding hit a post. But Chelsea's performance merited their 110th-minute winner by another debutant, Rachel Williams. Two goals in the last three minutes took 2012 FA Cup winners Birmingham past the battling Belles. However, Blues regained the lead through a lucky rebound off Kirsty Linnett and confirmed their passage with Jo Potter's 25-yard strike. Two goals by Toni Duggan gave City a hard-fought win. The England striker tapped in Krystle Johnson's eighth-minute cross to open the scoring and decided a tight tie from close range 11 minutes from time. Kirsty McGee's 13th-minute goal for Reading proved nothing more than a consolation. Dunia Susi bagged a brace as Notts saw off their plucky Premier League Southern Division opponents. Susi put County in front with a brilliant 23rd-minute solo effort, racing through from the half-way line to shoot home, then doubled her tally from close range. Karen Clough scored a consolation goal in the last minute. Martha Harris and Natasha Dowie were on target to take the WSL champions through to the next round. Harris, signed from Notts County in the close season, hit a seventh-minute debut goal to give the Reds a great start. And although the WSL2 Black Cats went close through Abbey Joice and Keira Ramshaw, Dowie's 58th-minute goal settled the contest. Everton were two goals to the good after little more than half an hour after Kelly Jones and captain Michelle Hinnigan struck, the latter from the penalty spot. Lauren Townsend pulled a goal back for the Premier League Southern Division side 13 minutes into the second half. But it was comfortable for the visitors after Nikita Parris restored their two-goal advantage 18 minutes from time. A late goal by striker Charley Wilson gave Portsmouth a famous victory. They trailed to Beth Jennings 48th-minute goal but not for long, Gemma Simmons equalising within five minutes. And Wilson set the Pompey chimes ringing with the winner four minutes from time.